Nestled in the foothills of the Andes, about 1000 meters above sea level, is the charming city of Mendoza. Known largely for being the capital of Argentina's wine making industry----especially the renowned Malbecs---Mendoza is also the center for skiing in the higher Andes peaks during July, August, and September. Plus the year-round natural hot springs just a short drive from town along with the beautiful parks and lakes in the city are fashioning Mendoza as a popular new vacation destination especially for budget-conscious travelers. The city is the perfect place to call home while taking short excursions, day trips, or even overnight journeys to explore the numerous different vacation activities in this diverse region. Filled with tree-lined avenues, beautiful plazas, historic architecture, and artisan markets Mendoza offers a relaxed pace of life in a bustling urban environment. The heart of the city pulses in the main square called Plaza Independencia, while the Parque San Martin offers a multitude of relaxing outdoor activities in a lush green environment, and the Area Fundacional is a trip back in time to the city's early settlement days. And of course the annual “la Fiesta de la Vendimia” in March is the wine festival for which Mendoza is now renowned worldwide. Finding accommodations in Mendoza can be challenging with a multitude of options and price ranges. Every style and size of hotel is available from major brand name chains to small independent pensionnes with everything in between. 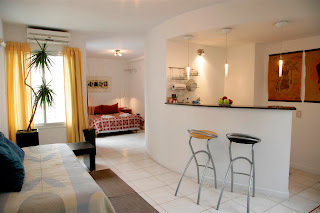 But the gay-owned and operated Deptosmendoza offers two alternatives for suite rentals in the heart of the city at reasonable rates with a variety of styles and sizes to match with every holiday budget. The Modigliani Art and Design Suites are eleven modern contemporary, comfortable, spacious apartments with complete facilities and a Galeria de Arte on the top floor. Coupled with the Dot Suites---a boutique resort, with only five unique units, minimalist design, with an emphasis on architecture, art, design and lighting---any vacation requirements and budgets can be accommodated by Deptosmendoza. The English speaking staff are extremely friendly and knowledgeable about the whole region and can assist with all holiday plans for time in the city or excursions around the region. A surprisingly “big-city” gay welcome and experience awaits the smart gay traveler in this cozy mountain retreat town. The dry desert-like climate almost guarantees hot sunny days for enjoying outdoor activities coupled with warm nights where outdoor dining is the perfect end to a high-altitude day. A sophisticated local culture blends with a simpler, unhurried lifestyle for a perfectly relaxing vacation. Great sights and experiences by day plus restaurants, bars, and cafes offer a multitude of nightlife entertainment options including gay and gay-friendly establishments. Late at night the Aristides Villanueva is the street for dining out and of course the action starts at about 10PM as with all Argentine dinners. Here you will find a festive atmosphere with large patios full of locals and tourists indulging themselves at restaurants offering every International culinary delight imaginable plus, of course, the renowned Argentine Parillas, where beef is a heavenly delight especially when accompanied by a local Mendoza vintage red wine. All at prices lower than almost any other major vacation destination in the world today! After dinner a leisurely stroll, perhaps some refreshingly cool Crema Helada---ice cream---and a visit to a local gay bar will be the perfect end to a fun-filled day. Either Queen or La Reserva Pub---the major LGBT bars in town---located in the heart of downtown Mendoza will be open and waiting to entertain you until dawn, or perhaps even later. On the weekends the city is very much alive at sunrise and as some people end their day almost as many vacationers are making an early start to theirs! It's easy to understand why so many smart gay travelers are including a visit to Mendoza on their South American holiday adventures. Suddenly it's being recognized for much more than just the annual wine festival in March.